Description: CSX 208 and 7600 lead its train to Rice yard. Description: 7600 assists CSX 208 with its train at Waycross, Ga. 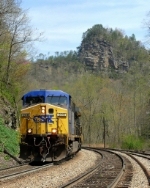 Description: CSX Q622-19 from the Rt. 11 overpass. Description: After leaving their train on the mainline, the power is heading to switch the chip plant north of town. Description: CSX AC44CW 208 leads R64731 (re-route of Q647 - Chicago Il. to Waycross Ga.) through Glendale. Description: CSX 208 has just exited Towers Tunnel, and rolls under its namesake looming in the background. Description: Q317 headed for Russell, KY. Train is heading south over Bridge #3 over the Little Kanawha River. The track in the foreground is the line from the low yard to the high Yard. Description: Bear Run Mine/INRD to Lockport, NY.